Looking for the Capricorn Horoscope for 2019? Every month, you will find here the astrological forecasts for your zodiac sign. Check the Horoscope for Capricorn, in 2019. 2019 will begin with very good options in love for Capricorns. They will test out new formulas, new ideas and project. Past problems may reappear and cause conflicts in emotional relationships. There will be an increase in eroticism in Capricorns who are in a relationship. They can also expect more personal satisfaction and happiness with their peers. There will be significant financial income for these followers of the sign and they will know how to manage their resources well. The Capricorns will embrace work and professional projects with passion in February. They will begin to feel more financially vulnerable but will ultimately know how to fix any problems. At the beginning of the year, the children of the goat will be more responsible with their physical well-being. Focus on good health and having more commitment to your own body and well-being. The energy will be exacerbated, which can be good to channel into sports or physical activities, since it could lead to irritability otherwise. Those who are single will begin the second trimester with multiple opportunities to start a long-lasting relationship. There is a positive outlook for couples planning romantic meetings, surprises and trips. The influence of Mercury will enhance communication with your partner. Be prepared for creating new goals and redefining others. This will allow the followers of Capricorn to focus on their true interests. The sign’s qualities will shine while at your workplace and your work will stand out. Any effort that aligns with the Capricorn’s vocation will increase and be more effective. It is a positive period. In April, the followers of the sign will feel the need to meditate or relax, seeking the balance that allows them to overcome their nerves. The elderly may find bone or joint problems when going to the doctor and getting a checkup. Beware sexually transmitted diseases and unwanted pregnancies. The third trimester will begin with good energy with respect to love. Venus will promote good understanding between couples. Many will leave their fear of commitment behind, while others will overcome prejudices linked to intimacy. There will be an assessment of the couple and a need to move forward together. There will be a possibility to start a business with your partner or close relatives in July. Prepare for specialization of your profession or business on an international level, beware of excessive isolation at work. Students will shine in September. At the beginning of the third trimester, followers of Capricorn will be more emotionally dependent on other people. This will make them feel more vulnerable physically and emotionally. They will feel the need to rest. Avoid overdoing things when it comes to your health. There will be quick recoveries from discomforts and ailments in September. 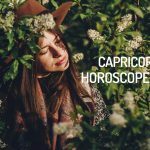 The last trimester will bring harmony to family relationships in love, and those under the Capricorn sign will want to spend more time at home. Relationships between couples will develop more intellectual contact than sentimental or physical. The end of the year in love has a positive outlook and you will feel the need to create a balance within the heart. Some business partners will help to produce good business and improve the results. You will have a good relationship with those who make the decisions at your work. It is an ideal period to ask for a raise or promotion. Beware of wasteful behavior, compulsive purchases and wasting money in December. Try to contain your consumer behavior. Your fortitude will increase, and your self-esteem will be reinforced. It is an ideal time of the year to switch from unhealthy habits to others that are beneficial to your health. Avoid contaminated places and sick people in November, since you could get infected. The end of the year has a positive outlook with respect to health. You will have lots of energy but be careful at any end of the year parties. Try to avoid overindulgence. The partial eclipse of the Sun in Capricorn on January 5th will be the perfect opportunity to reinvent yourself and visualize the objectives you want to achieve during the new year. The entrance of the Sun into the II House of Capricorn (01/20) indicates the arrival of significant new income. This transit also facilitates the management and organization of your own resources. Saturn, the ruling planet of Capricorn, will remain in the sign of the goat during 2019, which alludes to being responsible for your own welfare. On February 18th, Chiron will enter the IV House of Capricorn, evidencing emotional wounds which come from childhood and are associated with rejection or abandonment. The asteroid Eros will remain in House VI of Capricorn during the first half of February. At this point, your creative passion will be oriented towards the execution of work projects. In general, the health of the natives of Capricorn will have a positive balance during this period of the year. The entry of Juno into the VI House of the goat (02/11), will emphasize the need to commit yourself to your well-being. Eros, asteroid of lust, will be traveling through the VII and VIII Houses of Capricorn in the month of March, which can be interpreted as the continuous search for sensual experiences as a couple. Psyche will enter the II House of Capricorn on March 16th. For natives of the sign, this is about recognizing whatever aspects make them feel vulnerable related to the issue of financial security. Mars will enter the VI House of Capricorn on March 31st, increasing the physical vitality and levels of irritability of the sons and daughters of the goat. The entry of the Sun into the V House of Capricorn (04/20), suggests the possibility of entering a romantic relationship, which transcends just a casual and momentary occurrence. The double Full Moon in Libra on April 19th will touch the X House of Capricorn and will push the sons and daughters of the goat to rethink their professional goals and build a personal definition of success, one that is not subordinate to old beliefs or the interests of others. The retrogradation of Jupiter will begin in the XII House of Capricorn on April 10th, affecting the sleeping patterns of the natives of the sign. This planetary movement is favorable for the practice of meditation, prayer and spiritual pursuits. The entrance of Eros into the IX House of Capricorn (05/06) promotes trips as a couple to unexplored places, and romantic interest in people from other cultures. The entrance of the Sun into the VI House of Capricorn (05/21), is an invitation to stand out in your workplace. It is not about crushing the competition, but about expressing your talents freely. With Pluto and Saturn in retrograde in the sign of the goat, it is a good idea to watch out for the appearance of symptoms associated with bone ailments, skin diseases and diseases related to the reproductive system (female and male). The entry of Mercury into the VII House of Capricorn (06/04) will encourage open dialogue with your life partner; Take the opportunity to communicate your concerns and aspirations. With Venus in the VI House starting on June 8th, you will find pleasure in the development of their daily activities. This transit is ideal for regaining love for your profession. Beware sexually transmitted diseases (Venus in the VI House – Pluto and Saturn in retrograde in Capricorn). The entrance of Venus into the VII House of Capricorn (07/03), indicates harmony in relationships. Weddings, engagements and celebrations will be announced. Possibility of entering into business agreements involving family members or your life partner. The retrogradation of Chiron into the IV House of Capricorn starting on July 8th increases your susceptibility and can awaken innate tendencies towards attachment, possessiveness, dependence on relationships (familial or sentimental). The Venus Star Point (conjunction Sun – Venus) will take place on August 14th, this will impact the VIII House of Capricorn. The event will help the follower of Capricorn to decipher the fears that they hide. Fears linked to intimacy and the level of delivery in relationships. A satellitium (an accumulation of planets) will take place in the IX House of Capricorn in the month of August. This astral phenomenon indicates growth in subjects related to international projection and higher studies; But beware, because it can also nurture the desire to live in your own world, without recognizing what happens in the present. The beginning of the direct phase of Jupiter in the XII House of Capricorn (08/11), will allow you to enjoy a restful period and extract valuable lessons from contrasting experiences (also known as “negative”). The North Node will be positioned in the VII House of Capricorn House in 2019, which can be interpreted as valuing the importance of your partner and family in being able to grow (and get rid of prejudices). September will be a particularly positive period for the students of Capricorn, and the sons and daughters of the goat who decide to start learning other languages. Saturn will begin its direct phase in Capricorn starting on September 18th, promoting physical recovery for the natives of the sign. The Full Moon on October 13th, which will touch the IV House of Capricorn, is the culmination of home reforms and the application of healthy boundaries in family relationships. The transit of several planets over the XI House of Capricorn, among which include Pallas and the Sun, represents the possibility of creating strategic alliances, which will give a greater push to professional projects. Finally, Pluto will conclude its retrogradation in the sign of the goat (10/03), motivating the natives of Capricorn to connect with their personal power. The entry of Venus into Capricorn (11/35) presents a more realistic perception of love; it is not about forgetting romanticism, but about considering the practical implications that come from establishing a partner relationship. Mars will remain in the X House of Capricorn until November 18th, which favors deals with the hierarchical superiors and promotions into executive positions. Mercury, ruling planet of the VI House of Capricorn, increases sensitivity to viruses and infectious diseases during the first half of November. A new solar eclipse in Capricorn will take place on December 26th, so you can analyze the progress of your personal goals and modify them if necessary. The entry of Venus into the II House of Capricorn (12/20) can induce impulsive purchases, which will unbalance your budget. Before going out to stores, set a spending limit. The entrance of Jupiter into Capricorn (12/02), will result in physical strength for the sons and daughters of the goat; however, it is advisable not to abuse your strength or overeat. Capricorn starts the year with the need to make drastic changes in the affective level. You need more security and to rely on the person you have by your side. It would be important to review your diet at the beginning of the year even if you’re feeling in pretty good shape. Opportunities to increase resources are presented in various forms. A period of creativity begins. The family atmosphere will be pretty welcoming to the natives of this sign. It is very important to try to understand your love partner. Good working environment and good projections for the future. The cooperation of your partner will help you overcome some differences. By the middle of the year, the couple is strengthened and there is an increase in sexual activity. Good time to start studying or to invest in professional knowledge. You will have an invigorated mental clarity, which will help you to expand your area of business. You might have some headaches and migraines and, again, some tensions with friends and family members. By the end of the year, professional goals are clarified and positive results begin to arrive. You will feel tired and with the need to devote more time to sleep and relaxing. The relationship with your partner will have a positive boom and there will be a better communication with your loved ones. You’ll end up the year by efficiently managing your resources and, despite the increase of your expenses, you’ll be able to maintain stability. The total eclipse of the Full Moon in Leo, on January 31, will touch the VIII House of Capricorn, which translates as moving away from things that do not work. It does not necessarily imply ending a relationship, but it does imply situations that hinder your personal development. Transformation is necessary. The entry of the Sun into the II House of Capricorn (01/19) indicates a significant improvement in finances, but also the tendency to base your own worth on material possessions. The physical state of the natives of Capricorn, will remain stable during this period of the year. It is an ideal time to perform a regular medical check-up, or consult with nutrition specialists about changes in eating habits. The issue of centering your own worth on material possessions will grow in importance during the month of February, due to the partial eclipse of the Sun in Aquarius (02/15). In the same way, you will look for a way to be more efficient in management of resources. Opportunities and financial improvements will be received with joy, but deep down you will question whether they really bring you closer to your proposed goals. With Pluto and Saturn on Capricorn, you will not go through great health disturbances during the month of February. However, it is important that you consider the idea of starting an exercise program, something from low to medium impact, with professional support. Jupiter, planet of expansion, will begin its retrogradation period in the XI House of Capricorn (08/03), which implies the need to evaluate relationships with friends, given that there is a tendency to compare yourself with peers, and ending up underestimating yourself based on the results. The presence of Venus in the V House of Capricorn, starting on March 31, marks a period of intense creativity, especially productive for those dedicated to the arts and innovation. The entrance of the asteroid Pallas to the II House of Capricorn (03/29), is an excellent tool to organize your routines of exercise, eating, rest and work. The atmosphere in your home environment will improve considerably, thanks to the conclusion of the retrograde phase of Mercury (04/14). It is crucial to leave aside impatience, in favor of understanding. The entrance of Venus in the VI House of Capricorn (04/24) indicates regaining a love for daily activities, especially your work, observing them from a perspective of gratitude. During the month of April, Saturn and Pluto will begin to retrograde on the sign of Capricorn, which will force you to take create care of your health, particularly for those individuals who suffer chronic ailments related to bones, and joints. The asteroid Pallas will enter the VII Capricorn House (05/21), stimulating the feeling of cooperation in couples. This location is also very positive for those entrepreneurs who have associates. Good perspectives in the workplace. New projects will capture your interest, and will help you to promote yourself professionally. With Pluto retrograde in Capricorn, and Venus in the VI House of the sign, there is a propensity to suffer gynecological disorders (in the case of women), or ailments that involve the urinary system. June will be an excellent time for love and romance. The entrance of Venus in the VIII House of Capricorn (06/13), favors both the development of intimacy as a couple, and an increase in sexual activity. Mars, warrior planet, will begin to retrograde in the II House of Capricorn, a planetary movement characterized by frustrations in the economic plane. Fortunately, you can count on the support of your life partner or close relatives in facing the obstacles. The presence of the Sun in VI House of Capricorn, until mid June, promotes a progressive recovery from diseases and ailments. However, there is a possibility of suffering fractures or dislocations in the lower limbs during this period of the year. The partial eclipse of the Sun in Cancer (07/13) will touch the VII House of Capricorn, which can be interpreted as the beginning of an important relationship (for single people), or a new level of commitment in a couple’s relationship, where there is more consideration for the interests of the other person. The entrance of Venus to the IX House of Capricorn (07/09) is a planetary movement for students, especially those who wish to enter exchange programs or take courses abroad. In general, the health of the natives of Capricorn will remain stable during the month of July, but it is important that they keep dental care in mind, and go to the dentist if there are any sudden pains. On August 11, the partial eclipse of the Sun on Leo will take place, which will affect the VIII House of Capricorn. This stellar event invites you to face your deepest fears, and reinterpret the very concept of intimacy. The entrance of Venus in the X House of Capricorn (08/06) marks the beginning of an intense season dedicated to promoting your professional image. Take advantage of this period to expand your network of contacts, and make yourself known in the circles you would like to be in someday. Mars, warrior planet, begins its process of retrogradation in the sign of Capricorn (12/08), which can generate intense stress and frustration from the desire to achieve a certain position or goal. Another manifestation of this planetary movement are headaches or migraines. Despite the retrogradation of Uranus in the V House of Capricorn, it affects romantic vibes. The culmination of the retreat of Pluto and Saturn, will contribute to improve the mood of the natives of this sign. September is a promising month for Capricorn students, who seek to expand their horizons, deepen their studies or change majors. Likewise, it will be a good time for those who wish to establish professional connections abroad. Saturn and Pluto abandon their process of retrogradation, which will help Capricorn’s sons and daughters to progressively recover from the ailments they faced in previous months. Venus will retrograde in the XI House of Capricorn, starting on October 5th, which will revive tensions in groups of friends, created by the retreat of Jupiter, during the period of March through July. The beginning of the retrogradation of the asteroid Juno in the VI House of Capricorn (10/11), indicates problems with delivery deadlines at work, which may lead you to question your loyalty and commitment. Problems falling asleep, and in the case of achieving it, the lucidity of the images of the dream world, will cause mental fatigue and exhaustion. Jupiter will enter the XII House of Capricorn (11/08), which will allow positive lessons to be drawn from events in contrast which generated uneasiness in the past. The entrance of the asteroid Pallas in the X House of Capricorn (11/04), will give greater impetus to the achievement of professional objectives, with positive results in the short term, thanks to the start of the direct phase of Venus (11/16), in the same sector of the astral map (X House). Devoting time to meditation and/or prayer will help you maintain the mental balance you crave. Chiron will begin its direct phase in the III House of Capricorn, on December 9th, which positively influences the recovery of the relationship (and communication) with brothers and neighbors. The entrance of the asteroid Vesta in the II House of Capricorn (12/01), will favor efficiency while managing available resources, so that despite an increase in expenses, you can afford any commitments that arise. Vitality and physical strength. Avoid abusing meals with excess fats, or you may suffer intestinal disorders.